"If only there was a game console that was also a Blu-ray player." 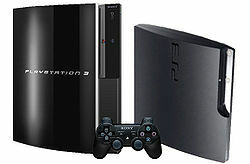 The third generation of Sony's PlayStation console, the PlayStation 3 tried to do with Blu-ray what PlayStation 2 did with the original DVD format. They succeeded, but it took a significantly longer period of time. Sony knocked HD-DVD out as a competitor, but primarily did so by rallying market support towards Blu-ray rather than offering any real innovation one way or the other. The recession a couple years after the PS3 launched slowed down the sales of HDTVs, which meant the synergy needed for Blu-ray to take off was hurt (regular DVD didn't need anything other than people having TVs with audio/video plugs, or adapters if they didn't). It also represented a last desperate attempt by Sony to save SACD and the first couple of generations were compatible. This failed utterly and the feature was quietly dropped from the same iteration which finally gave up PlayStation 2 backwards compatibility. As HDTV has since gotten cheaper and caught on, this problem has somewhat healed, but not completely. The opportunity for PS3 to ride the wave of HD enthusiasm from launch has been Lost Forever. But the PS3 itself had bigger problems. The system was built with the dream of being an affordable supercomputer. Unfortunately, supercomputers are judged more by their relative processing power compared to computers of the age than by design and affordability. Even though the Cell Processor has a lot of speed, making an actual supercomputer from the system's parts requires linking several together. While several groups have done this, the need for multiple console units does defeat the notion of an "affordable" supercomputer. But by going with this design, the system cost a lot more to make than previous PlayStation systems. The system launched at $500 US for the low-end model and FIVE-HUNDRED AND NINETY-NINE US DOLLARS for the high end. Not only did this make the system one of the most expensive ever (in Europe and Australia it was on the level of the 3DO, CDi, and the Neo Geo) but the systems were being sold at a loss , and required the sale of five games per console before Sony broke even on the console itself. The plan was to make with this in terms of software and Blu-ray sales (at least Sony Pictures movies, partly why they were so aggressive in getting rid of HD-DVD), but Blu-ray sales are slower than they thought, and game sales, while decent, used to be below those of Xbox 360 games, although this is not necessarily the case anymore. The PS3's programming was notoriously difficult to learn at first, which meant more time, effort, and money spent on game development, and the 360 had a year start. Thus, early on, developers faced the problem of either accepting a lower profit margin for a given game or selling it at a higher price. Since the games, except for JRPGs, generally sold less (with some exceptions), but cost a lot either way (companies have stated HD games cost around two to three times as much as a Wii game), Multi Platform releases started becoming even more common than in any generation before. As developers have gotten the hang of this, the problem has been marginalized, resulting in more software releases as of late, both Multi Platform and exclusive. While it's not so bad now, early on these factors severely hurt the PS3 as it was and came in addition to an already bad PR problem caused by Sony's pre-launch marketing. Sony came across as arrogant, with Ken Kutaragi (the creator of the PlayStation) making statements such as the system would sell 5,000,000 even without games, and that he wanted people to want the PS3 enough to work harder to earn it (forgetting that the Crack is Cheaper notion was mainly with the base, not the mainstream). There are a couple of other infamous lines, but most of those simply became internet memes instead of hurting the system's reputation. Now, while the system itself is good, has a strong design, is probably the most reliable PlayStation so far, has better security than the PSP, has solid online and downloadable games on the Playstation Network, has quite a few other great features (if you want a Blu-ray it's one of the best players, and the PS3 had official Linux support), and doesn't charge for extras like the 360 does (online, wireless, a hard drive) it failed to reach the heights of its predecessors, which is a big fall. Sony wound up losing the console gaming throne it held with the first two PlayStations. The PS3 is not a failure, mind you, but it clearly wasn't the success Sony was hoping for. The console launched in late 2006, but didn't turn a profit for Sony Computer Entertainment until the third quarter of 2008. As of August 2009, a new variant of the PS3 has been released — the Slim, a smaller device with most of the same features and a relatively significant reduction in power needs. More importantly, this led to price drops all around, putting the PS3 within striking range of the Xbox 360. Since PS3s are still more technically advanced than Xbox 360s, and since Microsoft discontinued its midprice 360 model in the meantime, the fortunes of the PS3 have improved (as in, more releases). If 3D TV catches on, that might help, since Sony introduced 3D support with the 3.50 update and recent games like Gran Turismo 5 and Killzone 3 are taking full advantage of it. In a break from their usual pattern, Sony has decided to place the PS3's life cycle at 10 years (as opposed to the 6 year cycle of the prior PlayStation consoles), stating that the work that would've gone to a PlayStation 4 was instead allocated to their other projects, such as the Play Station Vita and their Xperia Play. The PS3 is notable for avoiding Region Coding, this maneuver comparable to that on the Nintendo DS. All PS3 games and downloadable PSOne games are region-free, and although the PSN store is picky about accepting credit cards from other regions, PSN games downloaded from it are not region coded. Blu-rays, DVDs, PS2, and PS1 discs remain region-locked. Originally, PS3 games were to have optional region-locking capabilities (where it's up to the publisher of the game to decide if the game was to be pressed with region coding) and a region-locking scheme was implemented on the consoles. But, due to consumer pressure (the first adopters for this system both knew about and hated the idea of region coding) and pressure from various governments, the idea of region locking PS3 games was quickly abandoned. Game discs manufactured were mandated to be region free. An HDTV is needed to guarantee playing all out-of-region games - while some PAL games will also run on NTSC televisions and vice versa, others will not. However, this doesn't mean that the game can't detect what region the console it's running on and react accordingly: The Country Switch trope entry has anecdotes of PS3 games that do detect the region of the console they're running on, although the most drastic thing these detections do appears to be simply disabling blood and gore if the console's detected to be Japanese. Which is funny when you consider another, somewhat unrelated, trope. PlayStation 2 support for the console was dropped on third generation consoles. Linux support was dropped with the introduction of the Slim version of the console. Older versions of the consoles will still be able to enjoy PlayStation 2 support though. As of firmware version 3.21 (released on 1 April 2010, and this is no April Fool's joke), the "OtherOS" support was dropped from the older models. The removal of the OtherOS function has gotten Sony some backlash and even at least six lawsuits including one by the Dutch government, although it should be noted that this was done to prevent piracy. Also infamous for a Dada Ad marketing campaign for the first year, but has gained some real acclaim for a recent marketing effort with their campaign of "It only does everything" (simultaneously a memetic mutation turned into a message of the console's strengths and a focus on the console's versatility, rather than confusing the public), coupled with the comedic offerings of Kevin Butler, the (fictional) VP of nebulous divisions. Even if some Nigerians don't find it very funny. At the 2010 Game Developers Conference, Sony unveiled the Play Station Move, a device similar in concept and design to the Wii, but which has more functions in addition to being both HD and 3D compatible, as well as having a high level of precision. Two controllers can be used at once, some games will use two of the primary controllers (the ones with the ball on the end) at once to simulate two handed actions, and others may instead use the secondary remote with the control stick and d-pad. The secondary one, called the Navigation Controller is not required, as the left side of the Dual Shock 3 aka Sixaxis can be used instead. It does require adding a PSEye camera to the system, though. It's also worth noting that regardless of whether the Wii was anything of an inspiration or not, or how much of one is disputed, development actually began as early as 2001. While the PS Move's sales are, as of the end of 2010, behind those of Kinect, it has generally received better reception with both its audience and professional level reviewers. The PlayStation 3 has also been the center of political controversy several different times. Among these times, the PSN was once shut down for weeks at a time due to a security breach, and LG once got the PS3 banned in Holland for 10 days.. The Cell Broadband Engine, or just Cell, is a POWER5-based CPU that's built a little differently from most processors. It has a single main core and 7 smaller cores. The Cell is designed with eight on the die, but to keep costs down, one of the cores doesn't need to pass CPU stress testing. Of the seven, only six are actually available for games with one of them used for the OS exclusively. The entire thing runs at 3.2GHz. It was designed to excel in parallel computing, and could even do the job of GPUs if needed. It can achieve a maximum of 230.4 GFLOPS in single precision floating point operations. The "Reality Synthesizer", or RSX. A slightly modified Nvidia GeForce 7800GTX. Officially uses OpenGL ES 1.1 with some NVIDIA's Cg. It technically could support Direct X, but due to it being a Microsoft API, there might've been licensing issues. It cannot support HDR and antialiasing at the same time, though the former can be faked convincingly. Supports "quincunx" antialiasing, which is 2x MSAA + the values of 3 neighboring pixels. This results in an image with less "jaggies", but is slightly blurred. Video acceleration is not supported on Linux, due to Sony restricting hardware-level access to the RSX via a hypervisor. 256 MB each for the CPU and GPU, the former being XDR memory at 3.2 Ghz and the latter being GDDR 3 memory at 700 Mhz. Stock hard drive space ranges from 20 to 320 GB, but it supports any 2.5 SATA drive. One Blu-Ray drive. Blu-Ray movies, DVDs and CDs are all supported. The first two generations of the PS3 also played the rare Super Audio CD, an ultra-high-fidelity audio disc format. Four USB slots . SD and CompactFlash card support was dropped late in the production run of the original "fat" console. A one gigabit Ethernet port. This can be used to communicate with other PS3s as well as the Internet. A port for composite (standard, non-HD TV) and component connections through special cables. ↑ Ironically, this inability was due to the copy protection measures placed in by Sony for the PlayStation 2. The PS2 has a built-in bypass for the copy protection on the discs, while the PS3 does not. ↑ This is probably because some governments were using the feature for non-gaming purposes. This page was last edited on 4 January 2019, at 17:36.